SoCal and art are a wonderful, inseparable combination. There are a never-ending abundance of galas, displays, and art shows to attend here on the West Coast. Near the apartments for rent in San Pedro, a new interactive event filled with local work is popping up. It’s called the 1st Thursday Art Walk, and it’s one you won’t want to miss. Here’s everything you need to know. This unique event takes place at the corner of 6th and Mesa streets right in the city of San Pedro. (That’s at zip code 90731, if you need to punch it into Google Maps.) The venue is simply called “Pavilion,” hosting a plethora of art galleries and creating studio space to accommodate local artists. The 1st Thursday Art Walk is new to the area and begins on November 1st. You can enjoy this event from 6-9pm as you walk trough the streets, enjoying art in various forms. There’s no cost to get in, either. This is an entirely free event. The entire downtown area will feature art galleries, opening receptions, and artists working on new pieces. Studios and more dot the streets, giving you the chance to view what the local art scene is all about. Live music will take place in the streets as well, in galleries, restaurants and shops. Each month, the 1st Thursday Art Walk will change. New artists in town means new pieces to explore in both galleries and rotating exhibits. New works from those that call the Art District home will also be on display. All exhibits include an introduction and overview, giving a little history and detail about the featured artists. 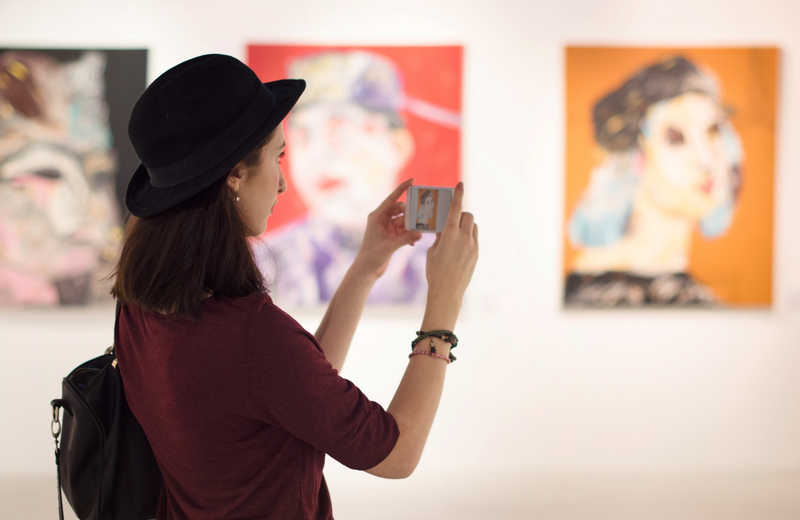 It’s an excellent way to discover all that the Art District has to offer. Both 6th and 7th Street feature a variety of shops, illuminated by the crisscrossing Tivoli Lights hanging above to set the mood for the event. Gourmet food trucks offer tasty treats and quick eats during the walk, giving you the opportunity to try some of San Pedro’s most unique cuisine. Of course, you can always stop in any of the restaurants in the area. Regional delights range from English Pub “grub” to Thai and organic raw vegan. The walk takes you through the city streets as you explore, taste, and experience San Pedro’s art scene. Best of all, the city plans to keep this event going month after month. For more information, you can visit the event’s website, the organizer’s website or call 310-832-2183. Each aspect is organized by San Pedro Historic, Waterfront Business, and the Improvement District. From The Vue, a series of new high-rise apartment homes overlooking the Los Angeles Harbor, is just moments away from the 1st Thursday Art Walk. This captivating living environment offers its residence everything they need to create their own comfort zone in the city. Filled with a plethora of on-site amenities, each carefully curated to accommodate Californian lifestyles, your every need from work to play is met in style. Stay active via the state-of-the-art fitness center or perfect your mountain pose in the yoga and Pilates studio, handle your entrepreneurial obligations in the business and conference room, or relax after a long day in the resort-style pool complete with cabanas. Catch breathtaking views in the sky lounge and rooftop terrace, the perfect oasis in the midst of bustling city streets. Entertain your guests with the clubhouse and media room. Take advantage of an extensive list of concierge services around the clock. Every element of The Vue is designed to elevate your sense of living. Each home within The Vue offers spacious floor plans featuring the finest in modern stylings. Imported tile flooring leads to expansive windows that offer spectacular views of the city or bay as well an abundance of natural lighting. Sleek, modern faucets rest on decadent countertops just below upgraded cabinetry. A stacked washer and dryer eliminate the tedium of community laundry, while energy-efficient appliances help to reduce your carbon footprint. Floor plans come in several styles ranging from one bedroom to three, each offering a variety of layout options to help you find something perfectly accommodating. Homes range from 707 to 1776 square feet, with two- and three-bedroom units containing two baths as well. It isn’t all about the space inside and around The Vue that makes life here so luxurious. These high-rise apartments are situated in a premier location along the bay. Just outside your door lies a vibrant community filled with charming cafes, microbreweries, and upscale restaurants to explore. Entertain yourself with Shakespeare by the Sea, the Alvas Showroom, or the Warner grand Theater. Grab a cocktail and a bite to eat at fantastic restaurants like the Baramee Thai or Green Onion. Find unique apparel out at House 1002, The Grand Emporium, and Badfish Clothing. Take a day trip to Pacific Wilderness or ride around the city with The Bike Place. The choice is yours. If you’re a commuter, as most of us here in California are, then you’ll be happy to hear that San Pedro’s public transportation options are just a block away. Hop on the Commuter EXP Line 142, the LADOT DASH, or the San Pedro Trolley downtown to get where you need to go. We invite you to experience life in the South Bay in an entirely new light. The Vue is more than just another city address, it ushers in a new era of comfort and luxury in California rentals. This seaside, chic high-rise places you front and center to the best of the best in San Pedro, with easy access to all the Bay Area has to offer. Not only do you have access to this vibrant and artistic area, you can take after-dinner strolls along the water is something you can do every day. The options here are endless, just waiting for you to discover them. Welcome to life elevated. Welcome to The Vue.